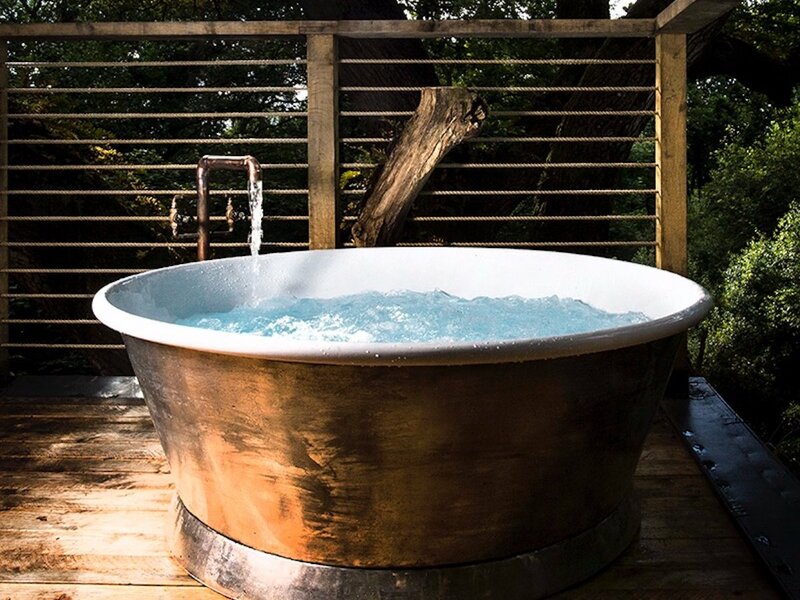 Nestled in the Dorset woodland, a few hours west of London, green woodworker Guy Mallinson has built a luxurious retreat foisted above the ground amidst spectacular oak trees. 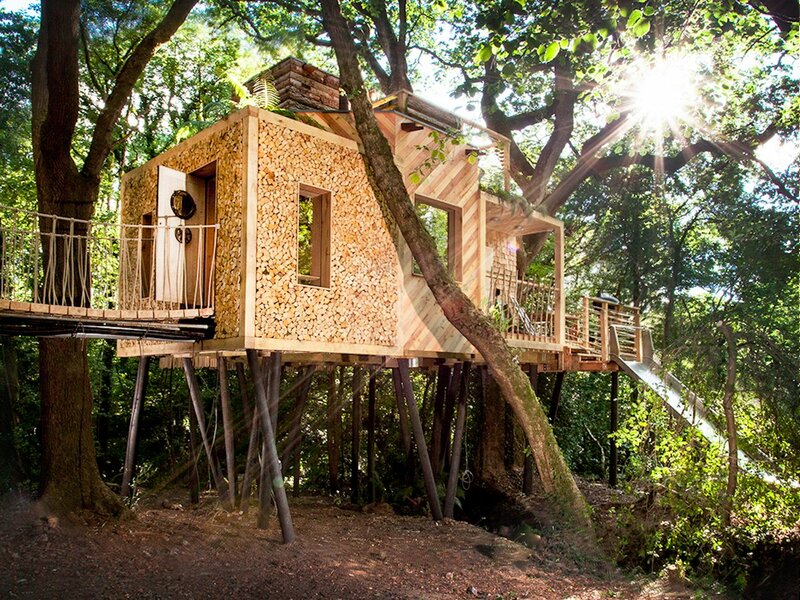 The Woodsman’s Treehouse cost £150,000 (almost $184,000) and five months to complete, with the design evolving during the building process. Mallinson and his crew have embraced the aesthetic properties of wood from the outset, with the facade clad in cleft sweet chestnut log stacks, oak laths, and hand cleft oak shingles. Built with local materials, it was paramount to the team that the natural ecosystem remained untouched. “We don’t touch the trees at all, allowing rain water to run down the stems and wildlife to travel up and down in the normal way, hence maintaining the delicate ecosystem of the oak tree,” Mallinson explains on his website . “We don’t stress the trees by imposing a heavy loads on them or by fixing bolts into them. 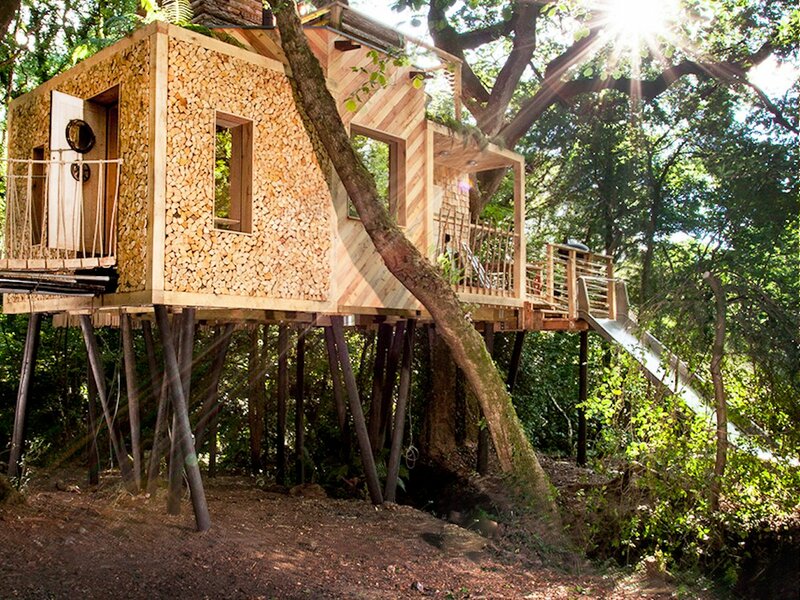 We believe that the tree has grown in response to its environment and as such should be left well alone.” The treehouse, which sleeps two people, is fitted with all the comforts of a luxury hotel. 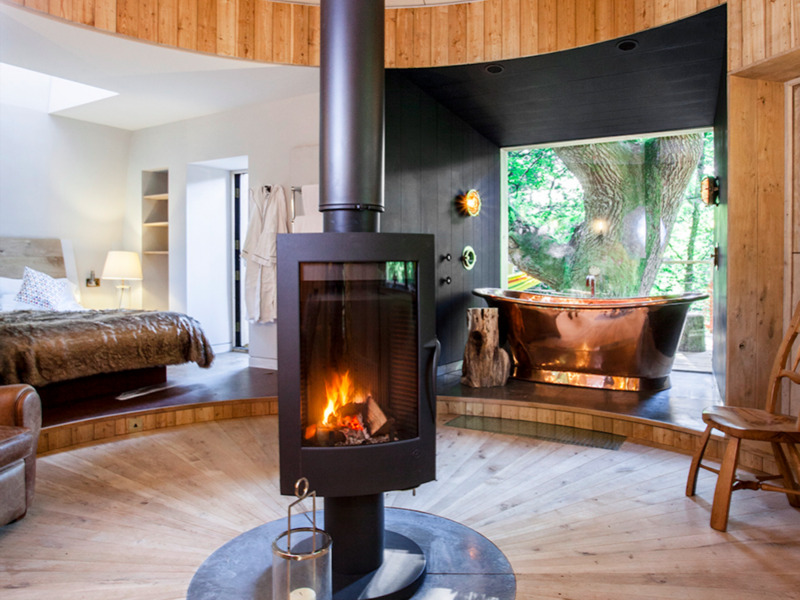 The circular interior contains a king-sized bed, kitchen, a double-ended copper bath, and a rotating fireplace. When you are surrounded by spectacular scenery, views are important. With this in mind, the space is fitted with a window in the floor to view the stream below, the bedroom contains a window in the ceiling for spectacular views of the canopy, and picture windows ensure you will be one with nature even while indoors. 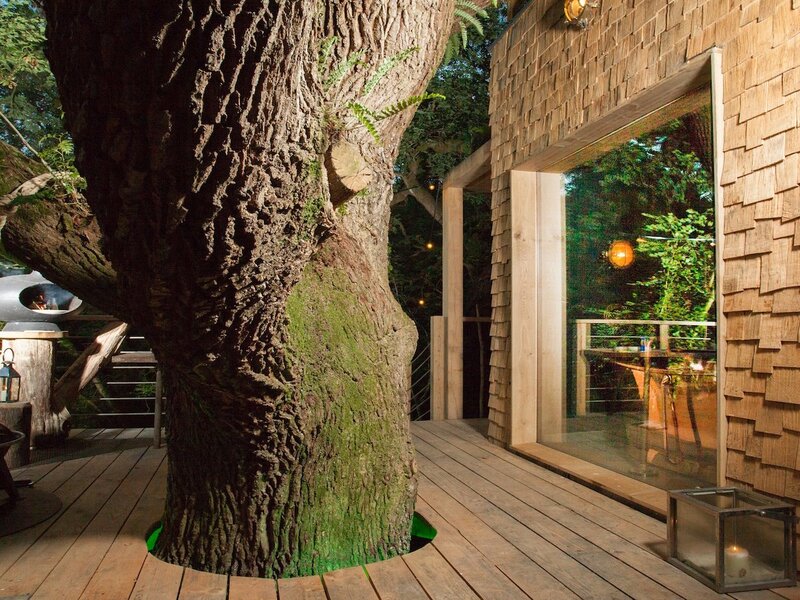 Outside, a series of decks reveal further luxuries, such as a wood fired pizza oven, a rooftop hot tub and sauna, an outdoor tree shower, and a large slide to bring you quickly to ground level. 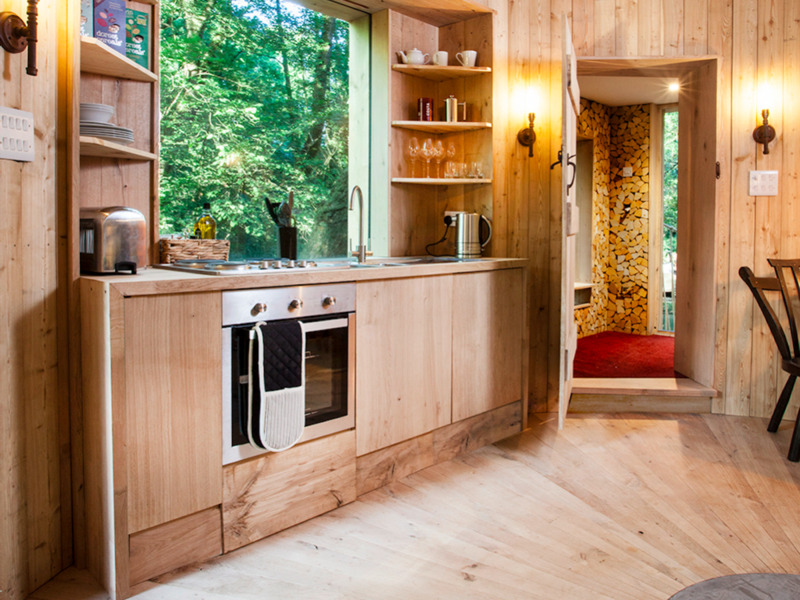 The treehouse, featured on the UK’s Amazing Spaces, has already been a hit with visitors and is available from £620 (roughly $760) for a minimum two night stay.